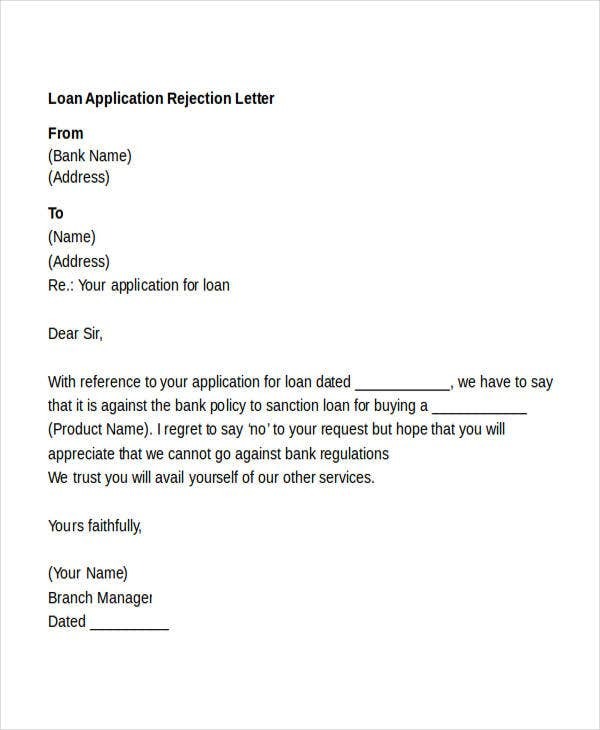 Rejection letters may be written due to a variety of reasons that may involve declining or rejecting an offer, a material, or any other proposal from another entity. 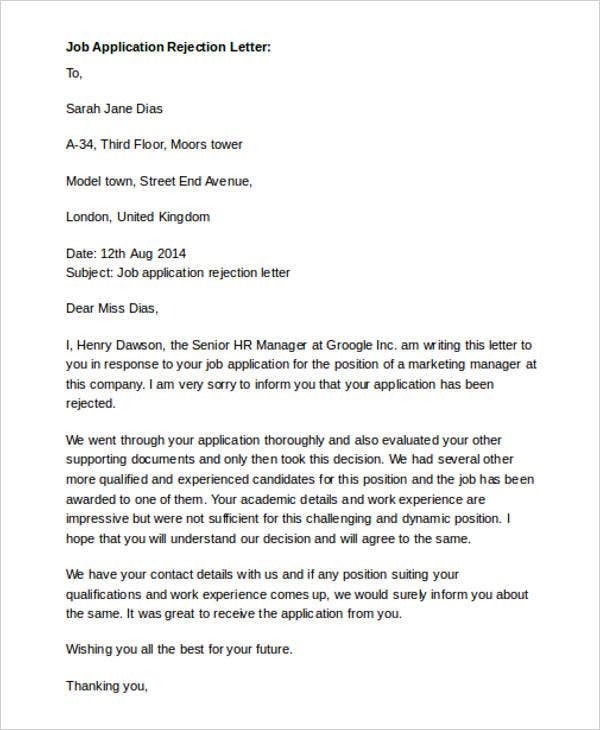 A rejection letter is a formal way of stating the decision of an individual or a group to decline a particular undertaking or opportunity given to him/her. You may also see Letter Samples. 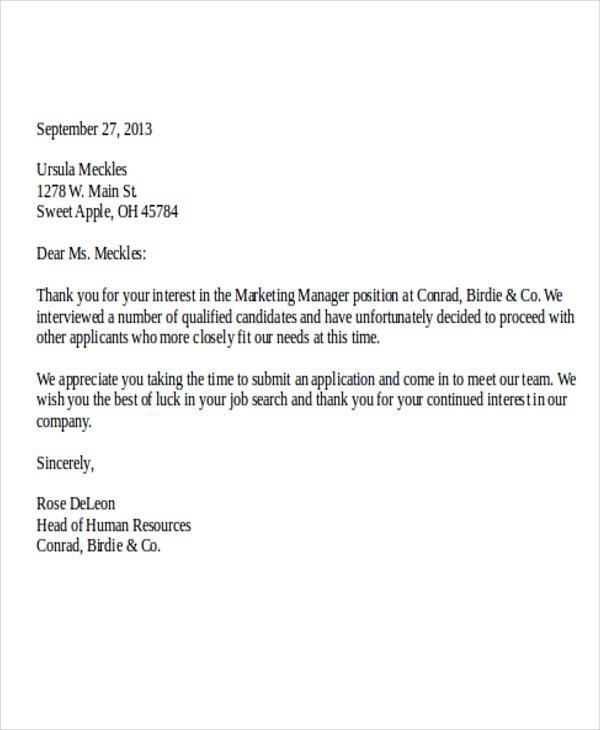 Declining a job offer is one of the reasons why a rejection letter is created. 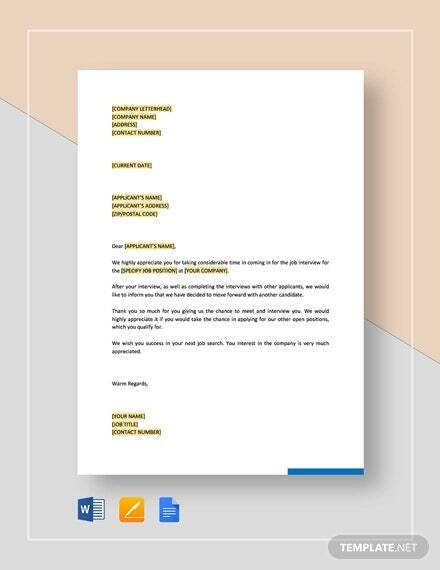 There are also offer rejection letter templates that are generated so that one party can inform the other of the decision to neglect, or discharge itself from a particular transaction. 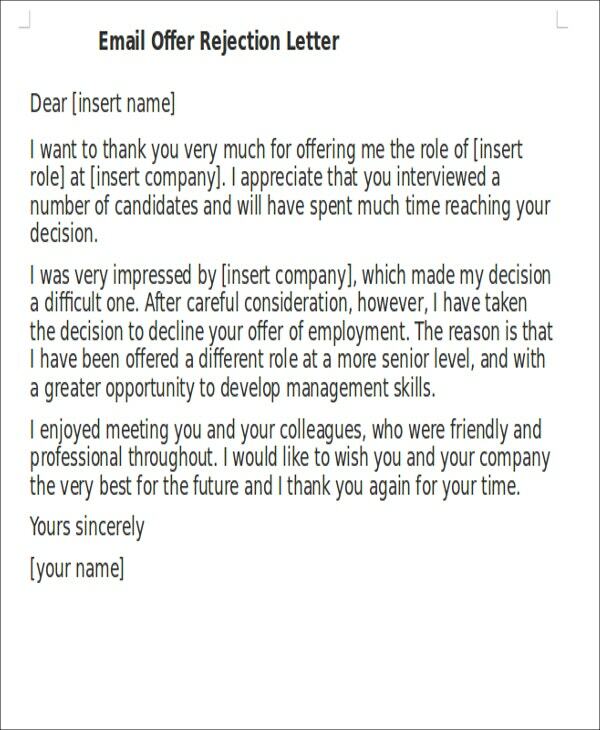 The rejection letter templates in this article will help you come up with a professional correspondence. What Is a Rejection Letter? 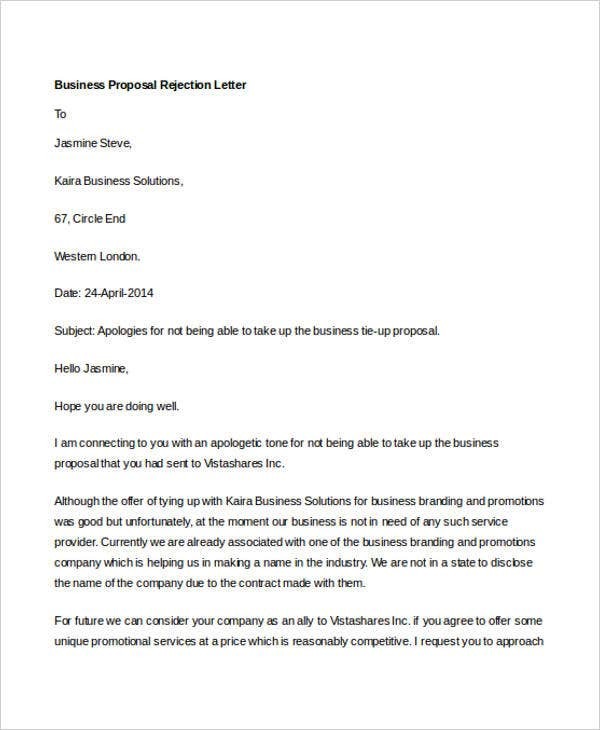 A rejection letter can be sent by one company to another should its representatives decide to refuse a partnership, sponsorship, or any other corporate transaction. 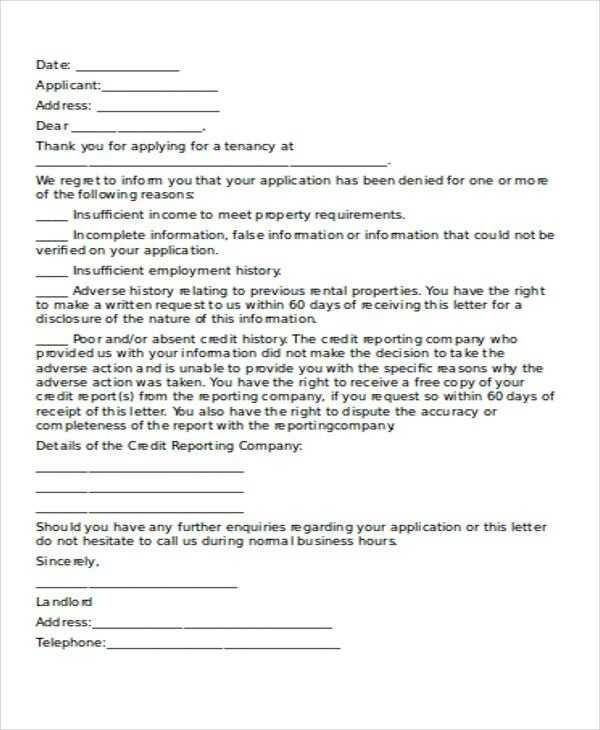 Rejection letters may be written by an employer who cannot accept an applicant for employment due to certain reasons. These may involve the weak qualifications of the non-hires or the candidate’s competencies not being able to match those of the competing applicants. 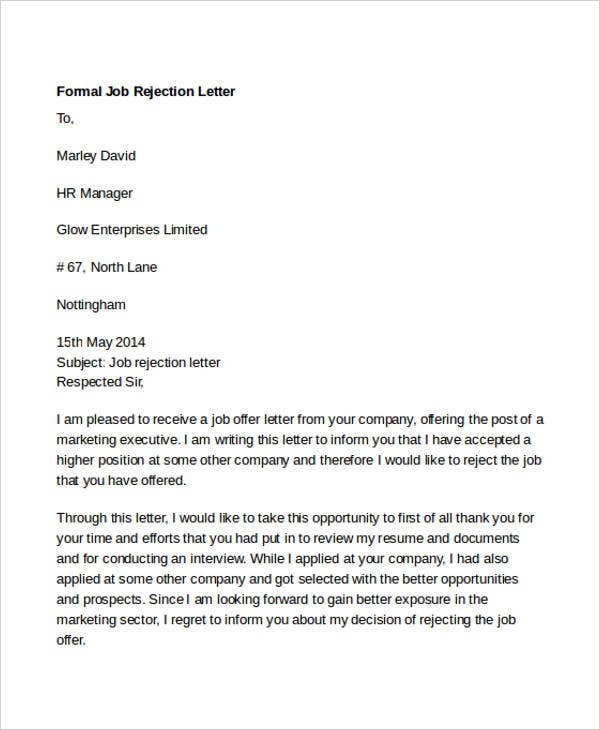 A rejection letter can also be written by a qualified work candidate who would like to reject the job offered to him by a company. 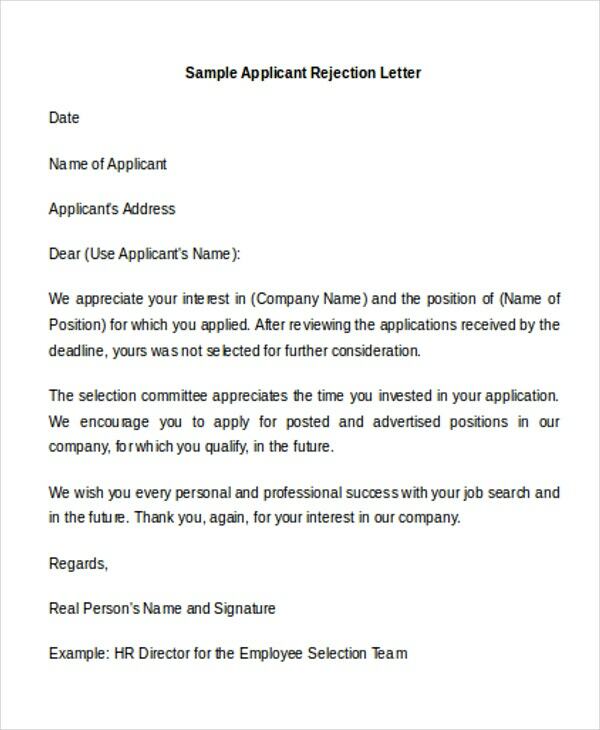 A job rejection letter is must be submitted to ensure that the company is aware that the applicant no longer wants to be a part of the business even if he has passed all the hiring procedures and requirements. 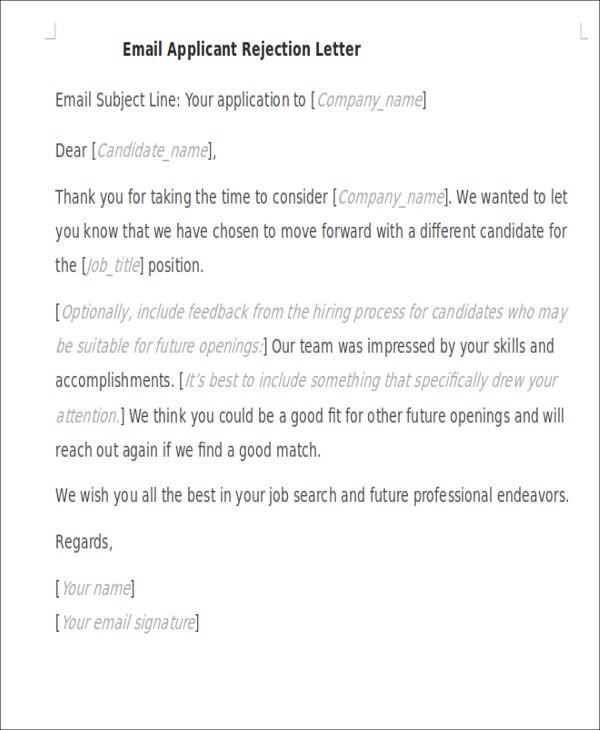 Offer rejection letters serve as the end of the professional transaction between an employer and an applicant during a specific hiring process. 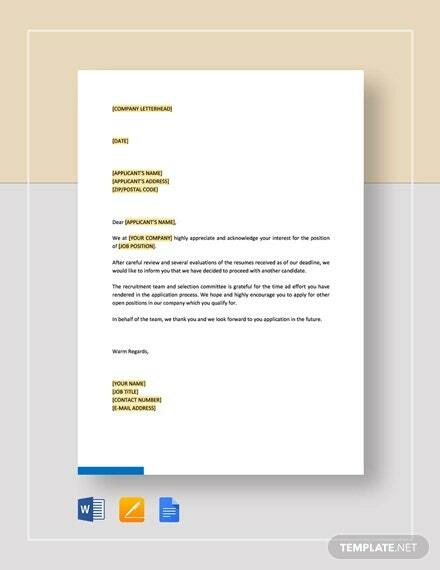 Rejection letters may also be written by companies and other establishments that have received solicitations for sponsorship and donations but can not provide the needs of those who requested the specified items. 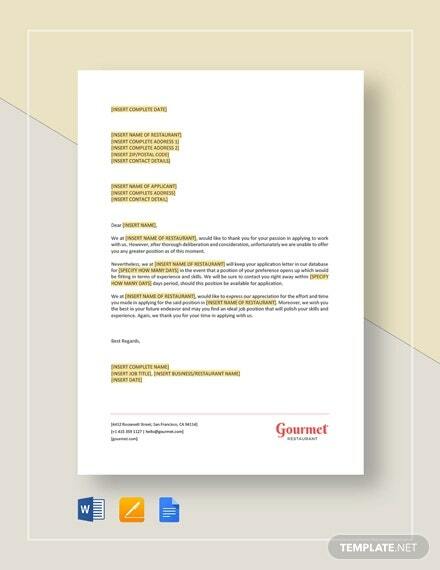 A rejection letter should be well-organized and well-formatted to ensure its maximum efficiency and effectiveness. A rejection may not be one of those transactions that entities, whether they are giant corporations or individuals, look forward to having. However,, there are just instances in which issuing one becomes a necessity. Always be reminded that a rejection letter is a formal document. Be aware of your sentence structure, document format and overall layout. Use words that are appropriate for a professional transaction. 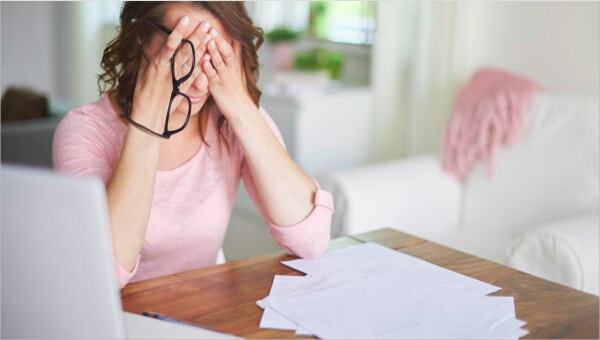 It is very important for you to make sure that you will still present yourself in a composed and calm manner even if the transaction is about rejecting an offer or any other deal. State the reason why you need to reject a particular proposal. 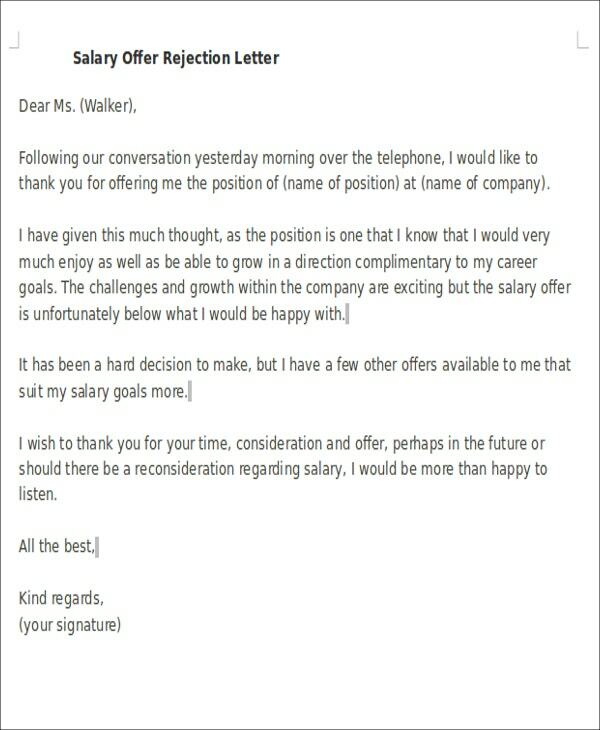 In terms of rejecting a job application, doing this will give the recipient the opportunity to improve. Furthermore, when it comes to business deals, this will allow the rejected party to come up with a better offer. 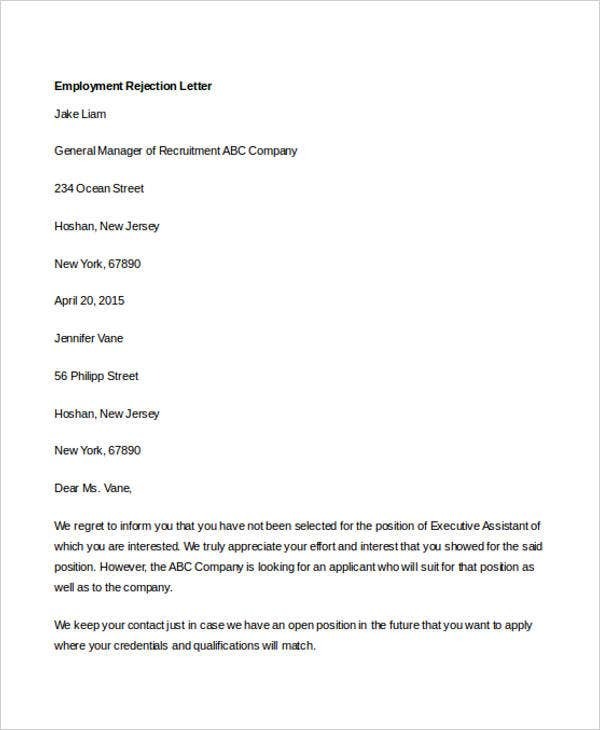 Organize the content of the rejection letter. Start with the purpose of the correspondence followed by the reasons that led to the decision. 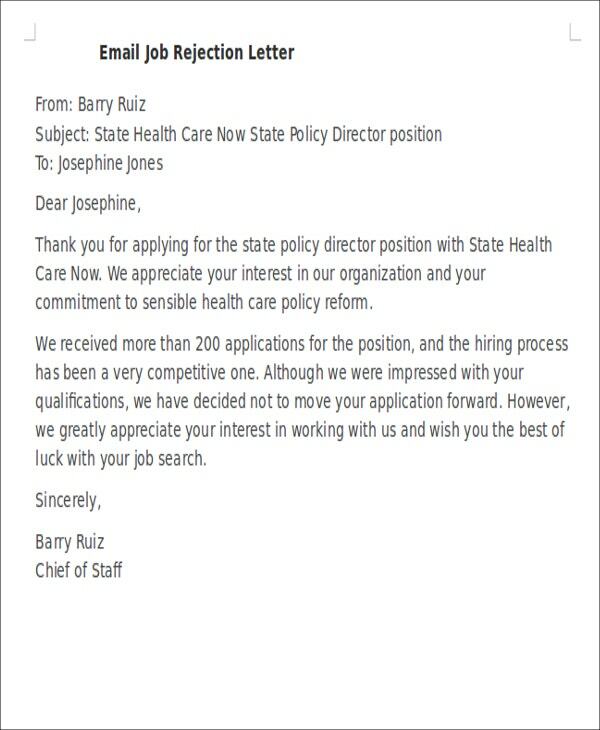 The applicant did not meet the initial requirements of the job position that he/she applied for. The applicant did not present him/herself well during the interview and failed to impress the interviewer/s during the process. There are other applicants who are more qualified for the position. Express your appreciation for the applicant’s interest in the company and (if applicable) for the time the applicant spent on the interview. Be sincere. 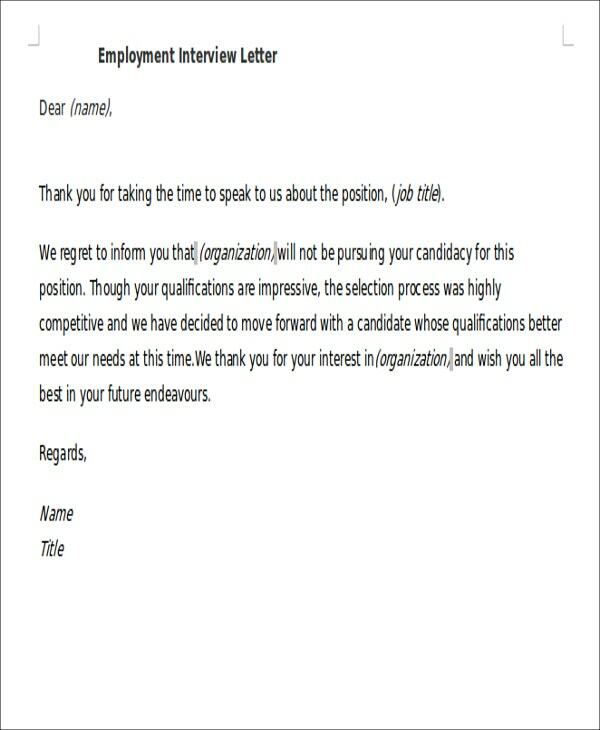 You can then tell the applicant that he/she has been rejected for the position that he/she applied for. Cite a few positive comments first before pointing out the negative ones. 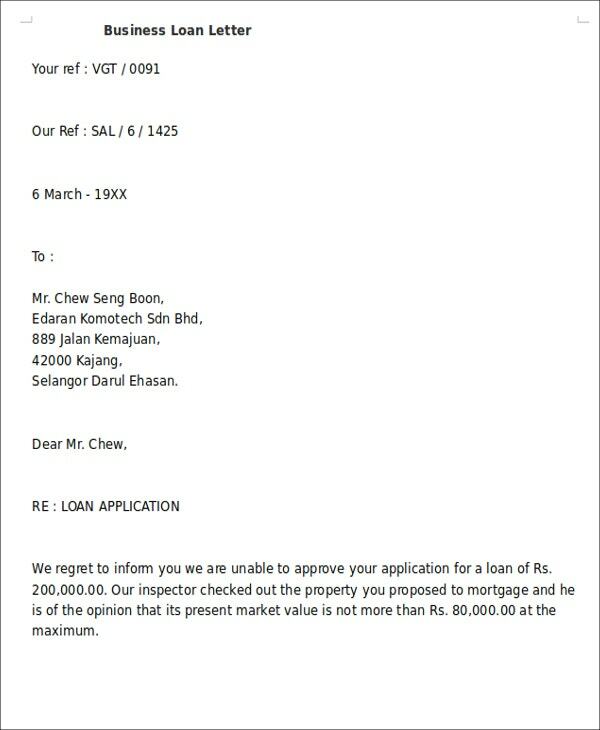 Afterwards, you can state the reason/s why the applicant’s application was not successful. 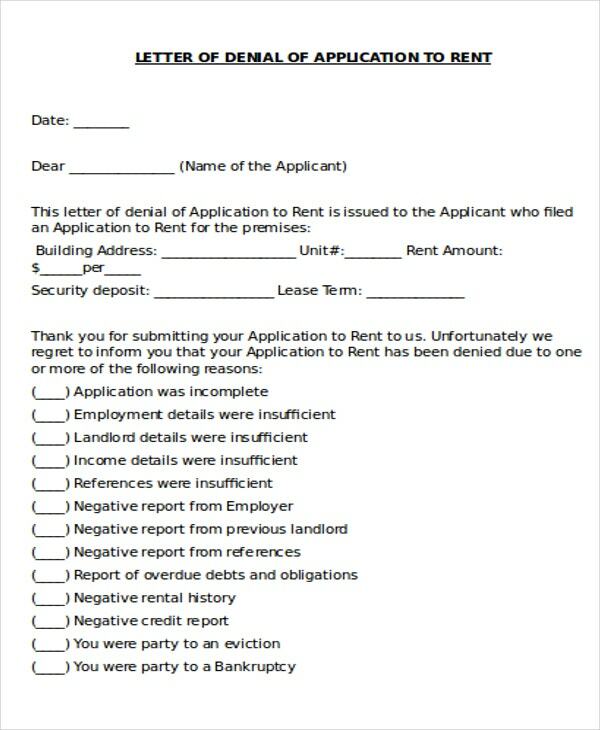 If company regulations allow, you can tell the applicant that you are open to entertaining them should they apply a second time. However, do not give any false hope. 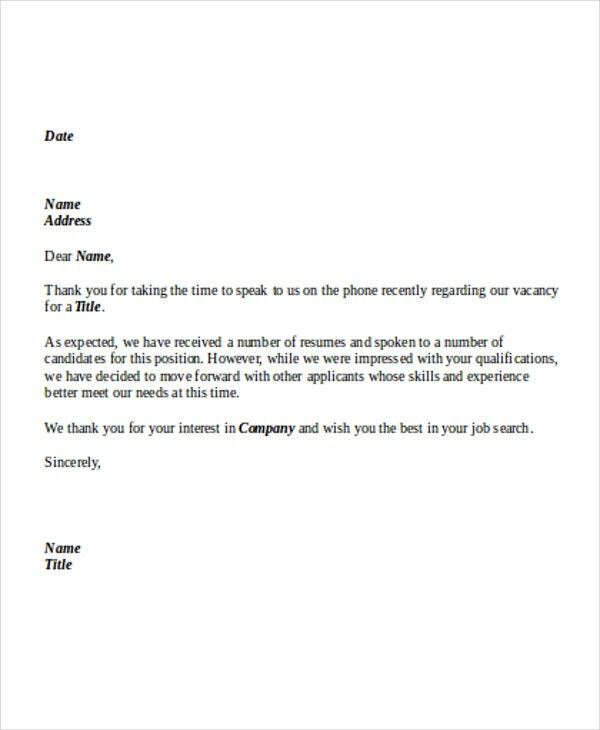 If you are on the other side of the process and you are an applicant planning to reject a job offer, your job rejection letter should also be formal, well-composed, and professionally formatted. 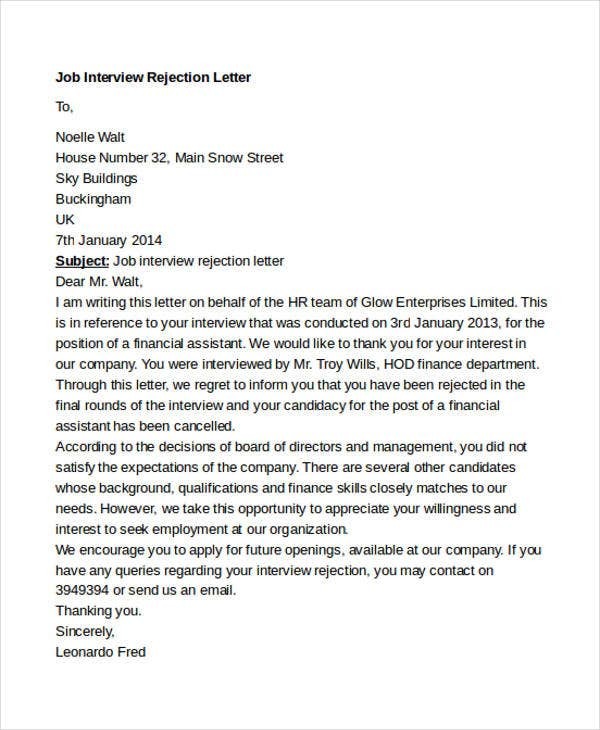 A rejection letter is not only limited to the creation of job application rejection letters. 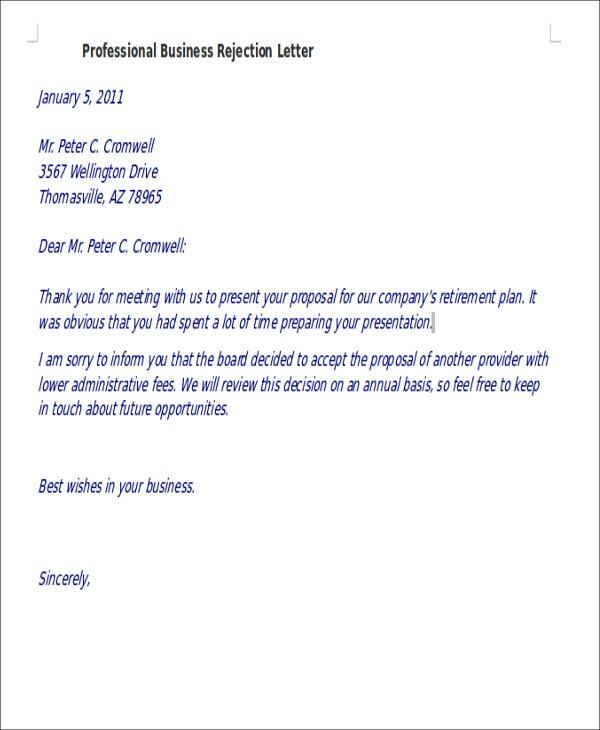 There are also casual or informal transactions in which a rejection letter may be considered important. One of these instances is when an entity needs to reject a specific invitation. The entity was invited to a certain event but already has other commitments on the date of the event. 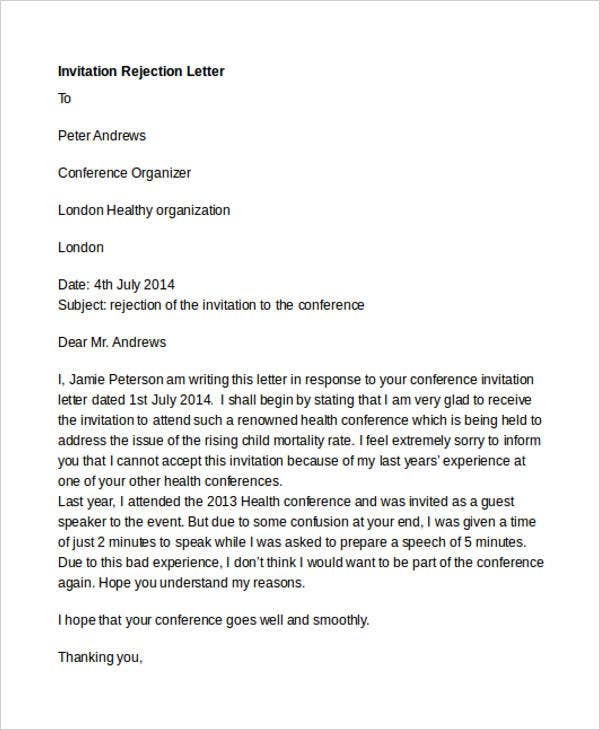 The entity who received the invitation is not comfortable in attending the event to which he/she has been invited. The job applicant has already been hired by another company. 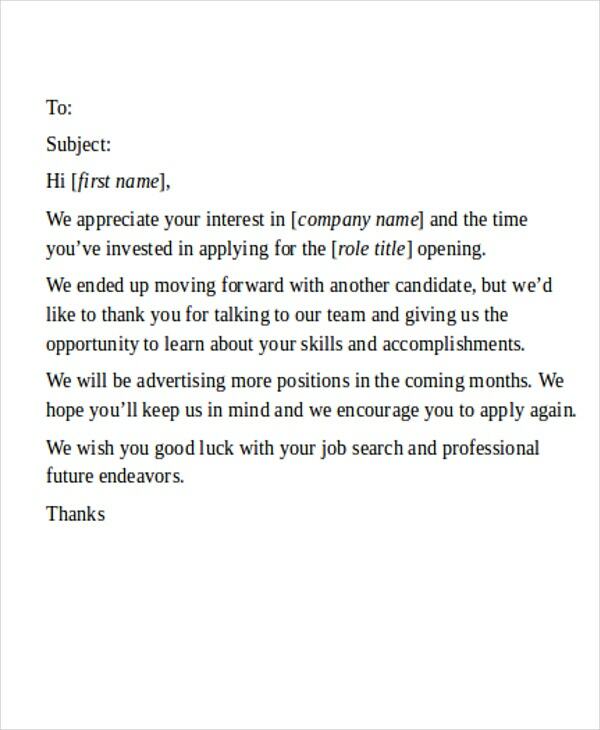 The job applicant has changed his/her mind about applying either for the position or the business where he/she initially wanted to be a part of. 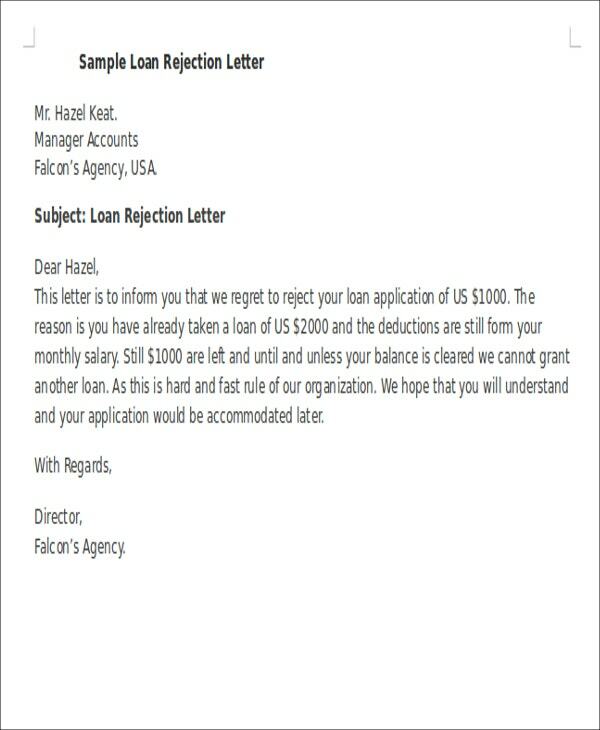 There are still many kinds of rejection letters that can be created for specific purposes. Whether it is a proposal rejection letter or a rental rejection letter, always make sure that you will be professional in terms of providing the details that led you to that decision.